The 64th Republic Day Celebrations of India will start at 9:00 AM IST onwards at New Delhi, India on 26th January 2013. Watch and download the Live online streaming of Flag Hoisting ceremony by honourable President of India, Republic day Parade and March Past, Awards and Recipients, tableaus of different states and the cultural ceremony of students at India Gate, New Delhi, India. The Live telecast is available on Doordarshan and the webcast is available on internet on http://republicday.nic.in. Our Country became Republic on January 26th in 1950. India declared itself a Sovereign, democratic and republic state with the adoption of the constitution on January 26th 1950. This Constitution gives the citizens of India the power to govern themselves by choosing their own government. Thereafter this day is celebrated as the Republic Day of our country and given a National Holiday. In 2013, we are celebrating the 64th republic day of our country. Republic Day is celebrated all across the country with great enthusiasm. On 25th evening, the honourable President of India address the nation at New Delhi. On 26th, The event begins with the Prime Minister of India laying a wreath at the Amar Jawan Jyoti at India Gate. Soon, a 21 gun salute is presented, the President unfurls the National Flag and the National Anthem is played. This marks the beginning of the parade. Every year, a notable foreign Head of State is invited as the Chief Guest. This year, Bhutan King Jigme Khesar Namgyel Wangchuck is the chief guest. 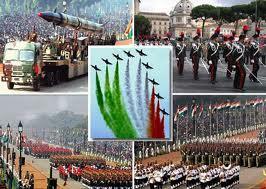 The major attractions of the event is the Republic Day Parade. Parades by armed forces and school children are held all over the country. But the grandest among all is held at Rajpath in New Delhi. The Honorable President of India presides the parade and is a tribute to the martyrs who sacrificed their life to save our nation from the enemies. The parade starts with the gallantry award winners saluting the President followed by display of various tanks, missiles and other equipment which is the rich resources of our Military force. The President takes the salute from the march past teams which includes regiments of armed forces, police, Home Guards and NCC. The Tableau's, displaying the cultural of different sates of India is another fabulous attraction of the parade. This follows the cultural dances and displays and patriotic songs of the school children across the country. Param Vir Chakra, Vir Chakra and Maha Vir Chakra awards given to soldiers for their outstanding deeds of bravery and selfless sacrifice and the National Bravery Award for Children is also given at this occasion. The parade also includes displays of skillful motor-cycle rides, by the Armed Forces personnel. The Parade is concluded by a Flypast by the Indian Air Force fighter jets over Rajpath. Happy Republic Day India 2013 SMS and facebook status updates are given here. Do update your facebook status with this collection of SMS. Do share these SMS with your friends too.